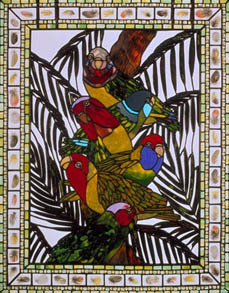 Angelika Traylor, award-winning stained glass artist, specializes in one-of-a-kind glass lamps, stained glass autonomous panels, architectural designs, and custom orders. Angelika Traylor's award-winning work can be recognized by its intricate, jewel-like composition. Often referred to as having painterly qualities, Traylor's work reflects an original and intensive design process, implemented with meticulous craftsmanship and an unusually beautiful selection of glass. Voted one of 200 Best American Craftsmen, "Early American Homes Magazine" in 1994, 1995, 1997, 1998, and 2000. Giftlines can be found across the country in many Galleries and Giftshops. For more information please contact the artist. If you cannot find a shop near you, you may find some of her items here.